From family to friends and beyond, here are some birthday greetings you can adapt for just about anyone. I'm so glad you were born into this world. Happy Birthday! Sending birthday wishes to my (sister, brother, mom, dad, etc.). Even if we weren't family, I'd love you anyway. To my beloved (wife, husband, sweetheart), you've had another year to grow even more wonderful. Happy Birthday! God couldn't have given me a better gift than making you my (son, daughter). I celebrate your birth today and every day. Here's a sampling of holiday greetings. May your stockings be filled with all good things. Merry Christmas! May joy and prosperity be yours this Kwanzaa. When I think of all the things I'm thankful for this holiday, you're at the top of my list. Happy Thanksgiving! A good mother is a true blessing, and I feel blessed ten times over. Happy Mother's Day! Dad, thanks for showing me what it means to be a good father and a good man. Happy Father's Day! Thinking of you all this Easter and hoping god's grace shines upon you. Let a friend know how much he or she means to you. Thank God I was blessed with a friend like you. You are one of a kind! Whenever anything happens in my life, you are the first person I want to share it with. Thanks for being my best friend. We've known each other since childhood, and you're still the best friend I've ever had. Thanks for being part of my life, and for letting me be part of yours. Friendship includes a lot of fun times, but it also includes a lot of forgiving and forgetting. Thanks for sticking with me through good times and bad. 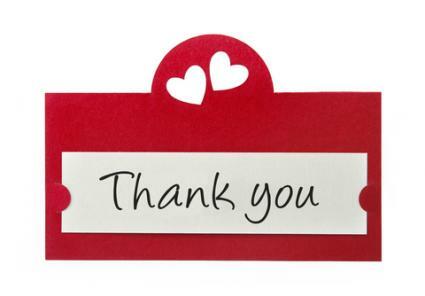 You can say thank you in a variety of ways. Here are a few phrases to help you get started. Thank you for your support during this difficult time. I truly appreciate it. Thank you for your thoughtful gift. It was just what I was hoping for. Thank you for the flowers. They truly brightened my day. Thank you for all your help. I couldn't have accomplished so much without you. 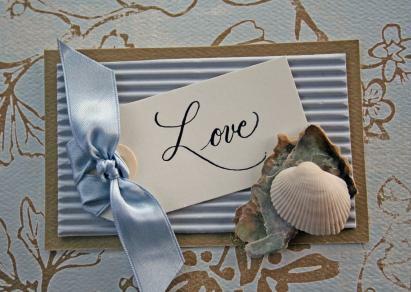 These sentiments work for any romantic theme, including Valentine's Day and anniversaries. In a world filled with people, I'm so glad we were lucky enough to find one another. I love you. No one makes my heart sing like you do. You are the symphony that makes the soundtrack of my life complete. When I look into your eyes, I see my own soul reflected back at me. There's no one else in the world that I love the way I love you. Without you, my heart couldn't beat and my soul couldn't fly. You are truly the love of my life, and I wouldn't have it any other way. My heart belongs to you and only you. Happy Valentine's Day! Use one of these sentiments to show your spouse how much you still care. After all these years, I still get a thrill when you walk into the room. Happy Anniversary, my love. Let's make a pact - sweethearts for life. Happy Anniversary, darling! My real life began the day we said, "I do," and I still love you just as much today. Happy Anniversary! Every time I look at you, I still can't believe how lucky I am to be with you. Happy Anniversary, sweetheart. Here are a few ways to express your thoughts for the happy couple. May your wedding day be filled with love and promises of a bright future together. From this day forward, your two lives become one. Live it to the fullest in love, joy and laughter. May your wedding day be the beginning of all your dreams coming true. No two people have ever looked so in love. May your marriage be filled with blessings. 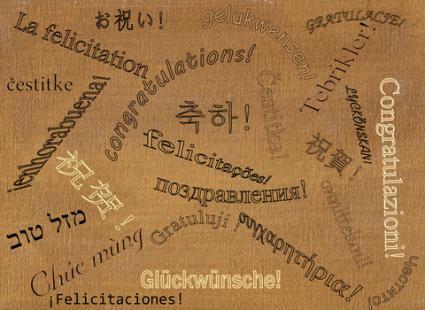 Celebrate someone's accomplishment with one of these sentiments. Congratulations graduate, you really made the grade! Congratulations on a well-deserved promotion. You earned it! Congratulations on the birth of your beautiful baby. May (his/her) life be filled with joy! Sometimes song lyrics, famous quotes or poetry can express what you want to say. Check out the follow websites for inspiration. Song lyrics add a dash of pop culture to your card making projects. If you know the recipient's taste in music, song lyrics can also be a great way to personalize your greeting. For a special touch, you may want to consider including a CD with the music of your choice in your card. Quotes from actors, comedians, athletes, politicians, writers, and other well-known celebrities can make an excellent addition to any handmade greeting card. Whether you're looking for a humorous quote about growing old gracefully or a tender sentiment to show your affection for a Valentine's Day card, there's a quote that fits your needs. If you're the type of crafter who loves to experiment with colorful rubber stamped designs, intricate paper piecings, and pretty patterned papers, you may not have much room left on the front of your card for text. Luckily, Craft Sayings has an extensive collection of short sayings appropriate for all paper crafting projects, including card making. Card making reference books offer another convenient way to find sentiments for your card making projects. Here are three titles worth looking at. You may also want to consider investing in a quotations dictionary or a poetry anthology for additional assistance selecting the right words for your homemade cards. 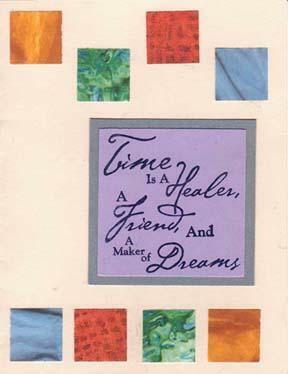 Hot Off the Press Card Maker's Card Quotes: These fun sentiments, printed in decorative fonts and available in several different themes, can be decorated with chalk, ink, or dye to add to any card making project. Technique Tuesday - Thinking of You: This clear acrylic stamp set features sentiments that are perfect for sympathy cards. As you can see, there's a treasure trove of sentiments available to use in your card making projects. Feel free to use the ones listed here, or add to them to make your own custom greetings.